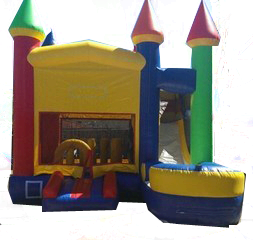 This Beautiful Multi-Color Castle 5 in 1 DRY Large Combo Design Bouncer is great for any occassion. MUST BE USED DRY. There are 5 activities for the kids to do, jump, climb, slide (appox 8 ft high),obstacles and basketball hoop. this unit can be used as wet also. IF USING AS WET,MUST BE BOOKED WET, UNDER "WET COMBO BOUNCERS" SECTION. It features an inflatable safety ramp at the entrance to protect excited kids as they scramble to get inside the bouncer. It also has large netted vent windows that keep things cool for the kids and allows parents to keep a watchful eye on all activities inside. Basketball not included, please select from our "Party Extras" to add to cart. Appox 6-8 users at a time.